Home » Christmas & Chanukah Gift Baskets » A GIft The Wine Enthusiast Will Love! A GIft The Wine Enthusiast Will Love! So you want to give a special friend, client, or family member, who is a wine enthusiast, a special gift? You are probably looking for something that will last longer than just a bottle of wine. Besides, they probably have a wine cellar full of fine wines already! 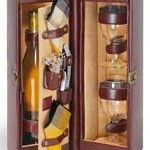 The Elegant Wine Caddy, made of premium leatherette, is a very popular choice. It is compact, sleek looking and very functional. The shoulder strap makes it easy to carry, and it comes complete with two wine glasses, two linen napkins, a stainless steel waiter style corkscrew, and a nickel plated fancy bottle stopper. Everything has it’s own compartment and there is a special compartment to keep the wine cold in an insulated velveteen lining. It is available in mahogany or black (click here for a larger image and more information: http://tinyurl.com/y8rtgej ). A deluxe version includes elegantly packaged gourmet cheeses, crackers, chocolates and more stacked on top and beautifully gift wrapped. This turns any Holiday or event into a celebration! Feel free to give us a call if you have any questions at 858-578-2740.